The Maine Edge is an online news outlet, in their words: Successfully targeting a younger, professional and more savvy demographic than the traditional newspaper, while also catering to the need for a lifestyle, cultural and entertainment-based publication across all demographics in the greater Bangor market, The Maine Edge has redefined the role of what a newspaper can, and should be. They did a feature on my book that, quite honestly, made me cry yesterday. Bad? No. It was that good. It’s the kind of review I’ll take out years from now to bask in the glory days, perhaps like Olivia or Alfonse did, in the Pen. There’s a big difference between literary fame and literary greatness. There are plenty of writers who are great without being famous and more than a few who are famous without being great. A very specific confluence of circumstances is required for an author to achieve both. But even the greatest, most famous writers come to the end of their story. 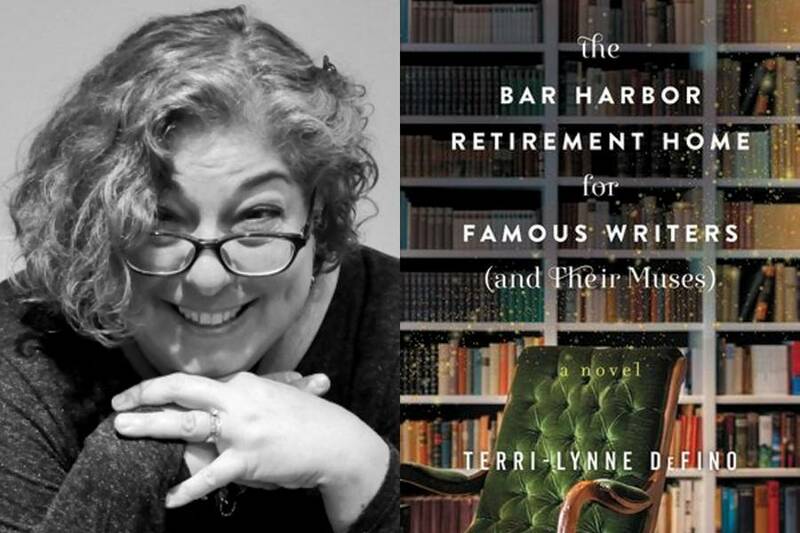 Terri-Lynne DeFino’s novel “The Bar Harbor Retirement Home for Famous Writers (and Their Muses)” (William Morrow, $15.99) takes a speculative look at what that ending might look like, creating a vividly detailed place where literary giants might spend their final days, swapping stories and generally accepting that the heady heights of their younger days are permanently behind them. In the late 1990s, Cecibel is an orderly at the Bar Harbor Home for the Elderly, a retirement home set up by literary legend Cornelius Traegar in an attempt to give his fellow wordsmiths a place uniquely their own in which to spend their twilight years. Despite the physical and emotional scarring, Cecibel is a beloved part of the community; the many writers and editors find her to be both a competent caregiver and fine company. But Cecibel is thrown for a loop when a new resident arrives at the home (nicknamed “the Pen” for obvious reasons). Alfonse Carducci is a true giant in the world of letters, one of the most decorated authors of his generation and the most famous resident ever to move into the Pen. He’s also Cecibel’s all-time favorite writer – one to whom she has been devoted for most of her life. Carducci is very much at the end of the line when he arrives, but being in the presence of old friends like Olivia Peppernell, a former peer (and lover) helps a little. Still, it’s the friendship that blooms between him and Cecibel that truly reinvigorates him. Yes, he is old and tired, but as he spends more and more time with the lovely, damaged orderly, the itch to create comes back. Doors long thought forever closed begin to creak open once again, letting loose the words and emotions and stories – truthful and fictional (and sometimes both). Some are inspired to embrace a future they once believed did not include them, while others begin to consider letting go of pasts that haunt them. And at the center of it all is the unlikely friendship between a broken young woman and a sick and aging legend. It’s interesting to consider what happens to writers when their stretch in the sun finally passes by. Even the greatest of the great will eventually fade into the shadows. “The Bar Harbor Retirement Home for Famous Writers” offers a charming, compelling glimpse at what might happen to such luminaries. The writers who populate the Pen display precisely the sort of quick and acerbic wit that you would expect to get from aging wordsmiths. These are people who defined and redefined literature for their generation – that power doesn’t just vanish when you reach a certain age. The jokes and jibes are well-crafted and genuine, creating a sense of reality that informs the dialogue. The central figures – Cecibel and Alfonse – serve as dual focal points for the narrative, providing the polestars by which the story is navigated. The quiet complexity of Cecibel, the constant avoidance of certain uncomfortable truths … she’s fascinating. Meanwhile, Alfonse hides behind a façade of bombast and bluster, all the while uncomfortably coming to terms with the looming specter of his own mortality. His works might be immortal, but he himself is not. DeFino has a wonderful ear, finding ways to craft dialogue that feels both true to the characters and true to life – a surprisingly difficult feat with which plenty of otherwise great writers struggle. She builds thoughtful, rich inner lives into her ensemble, as unafraid to point out her characters’ flaws as she is eager to celebrate their merits. “The Bar Harbor Retirement Home for Famous Writers (and Their Muses)” is an ideal summer read, breezy enough to be consumed lightly while still providing narrative and character depth. To paraphrase an old adage, old writers never die – they just fade away. What Terri-Lynne DeFino has done is give us a look at a place to where those writers might fade. Click here for the actual piece, if you are so inclined. Thanks, everyone who sent me a pic of The Bar Harbor Retirement Home for Famous Writers (And Their Muses) as seen in the wild. Keep them coming! I’ll add them to the slide show. As tomorrow (Chris D-day) approaches, emotion is precariously close to the surface. Every. Minute. Of. The. Day. The strangest things will set me off. Completely unrelated things. An oriole flying across the front yard. A commercial. My grandson explaining a game neither of us has any idea how to play. The Bar Harbor Retirement Home for Famous Writers (and their Muses) is a book set in the latter part of the nineties in a retirement home that is especially for famous writers, editors, publishers etc. The home was dreamt up by two writers, one who has passed and who one has finally come back to the mansion to live out the rest of his days among his contemporaries. In this story we follow a few of the writers, namely Alfonse Carducci and Olivia Peppernell, lovers in the past and good friends now and one of the orderlies named Cecibel who lives on the grounds and is dealing with issues of her own. She forms a camaraderie with them and serves as the muse that ignites their passion for writing again as they deal with the breakdown of their bodies in the aging process. This book is probably a contender for being one of my favorite books of this year, for sure. I loved everything about it. I loved the writing style, which was elegant and just evoked the feeling I love to get when reading a great piece of literature. There are alternating perspectives all told in the third person and I loved following different bits of the story from each of the characters. UGH THE CHARACTERS…they were so good and I love them all to bits and I just want to gather all of them up and hug them to me forever. This story was beautiful and tragic, comfortable and romantic. These are literally all of the things I felt when I curled up in bed and read this book. It was a gloomy, rainy day out when I read it which was just absolutely perfect. After reading this book I was torn between reading one and writing one. I really loved that this story was told through our main narrative but also includes the story that our characters are writing interspersed throughout. It was a wonderful thing to be able to experience that alongside of these characters. Ugh I loved this book if you can’t tell and I can’t wait to read it again. As someone who loves to write stories, I enjoyed every single moment where the lives of the aging writers was discussed and I loved reading about them writing. I could go on and on but I won’t, I’ll let you read this book and discover it’s magic yourself. If you love stories about writers and beautiful characters, read this book!! 5 stars from me! I don’t share all my reviews, but this one? I had to. And I wanted to put it here where I could go back and read it FOREVER! I’ve kept the Balrog at bay until today. The actual anniversary of his death isn’t until Friday; no matter what the date, for me, Father’s Day is always going to be Christofer’s last day on the planet. It’s the anniversary of the last chance I had to change everything. The anniversary of my failure to see all I should have seen. The last day my husband, children and I were all together. Forever and ever Amen. In the time since Chris’ death, things have changed. In my own life, our family life, the world at large. Life goes on, right? There have been some truly extraordinary personal events, from going to Europe for the first time to the entirety of The Bar Harbor etc. book experience; from my daughter and her family moving back to New Milford, to putting the house up for sale. Lording over it all, my Balrog. Like Gandalf, today, I fall. It’s okay. I need to fall once in a while. I need to feel all the pain of losing my son. It feels strangely good, like pressing on a canker sore. I’m not looking for sympathy (though I’ll always take hugs.) I just needed to get it out of my head, and this is my place to do so. I promised I would. It helps. This week will be another amazing one, I’m certain. My grands will be here to swim, more Bar Harbor stuff, some dinners with friends. And today, I get to see my brothers and their families, my younger daughter, her boyfriend and their puppy. Of course, my parents. But I’ll still be in the snow with the Balrog, too. Like Gandalf, I’ll find my way out of the dark again. As always wiser, stronger, better able to fight the next time. Write up in The Boston Globe. Sorry to inundate with ME, ME, ME! But it is release day after all. And, really, this is–once again–so I can go back and bask. Or pull quotes from reviews. 🙂 Let’s hope they’re all good ones! Click on this –> link for a FREE sneak peek of The Bar Harbor Retirement Home for Famous Writers (and Their Muses). Two whole chapters! And click this–> link for a sample of the audiobook!